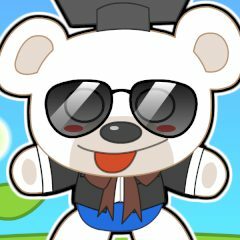 In this game you have a nice opportunity to dress up this cute teddy bear! Experiment with his clothes and accessories – you can combine different pieces of clothes. He is a dancer, so try to pick up some necessary suits for his next show. You can choose even the expression of his face! Have fun playing our dress up games!